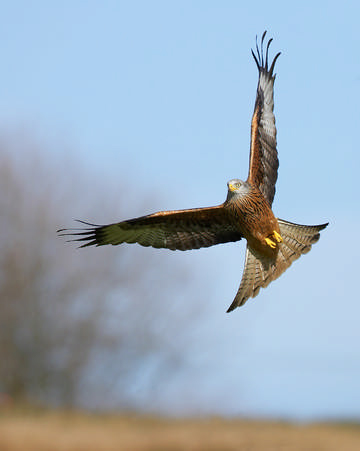 For several centuries the fortunes of the Red Kite in Britain have been intimately linked with man’s actions. They were common and performed an important role in urban sanitation until Shakespeare’s day, being valued and protected in England by Royal Decree – in 1465 killing a kite was a capital offence – although at the same time the King of Scotland was ordering their destruction. The Vermin Act of Queen Elizabeth I (1566) first targeted kites, along with many other species, supposedly to protect grain. The status of the Red Kite in Cheshire can be judged from the numbers killed for which a bounty was paid: 862 birds in the parish of Tarporley in 19 years from 1662-1681 and 698 birds in the parish of Bunbury in just eight years 1715-1722[, including 256 in the year 1720 alone] (Lovegrove 2007). By the late 18th century kites were scarce in the county, only found on the large estates, and by the year 1800 they had probably gone, Cheshire bearing the dubious distinction of being one of the first counties to extirpate the Red Kite (Lovegrove 2007). One of the last known to breed in England (in Shropshire) was shot in 1863 and in Scotland they persisted to about 1885. After that, the only Red Kites breeding in Britain were those in a rump population in mid-Wales, down, at its lowest point in the 1930s, to only one pair that reared young that survived and subsequently went on to become parents themselves, the species thus being almost extinct in the UK. Conservation measures, including ‘reward’ payments to landowners on whose land they bred, helped the Welsh population to grow, although the productivity was low at only around one chick per pair. The habitat in their mid-Wales remnant area is not particularly good for them and this was just the last area where they were not being persecuted, rather than the best area for them. Some kites had to forage up to 15 km from their nests, whereas in high quality habitat, most food is found within 3 km of the nest (Carter 2001). This has, however, been a great conservation success story and the Welsh Kite Trust estimates that in 2007 there were 670-840 pairs in Wales. In England and Scotland, Red Kites have been reintroduced from 1989 onwards to eight separate areas, using nestlings from Sweden, Spain and Wales to maximise the genetic diversity. This has been outstandingly successful in England, populations becoming self-sustaining and new releases being stopped within six years. The project has done less well in Scotland, where the kites’ diet makes them susceptible to poisoning. They will eat almost anything, but especially take carrion such as dead rats. Records in Cheshire and Wirral have increased greatly over the years. The annual bird reports show only eleven records in just nine of the years from 1964 to 1990. The next county record was probably the most instructive to date, a first-year female, known from her wing tags to have come from a nest in mid Wales, that lived in Tatton Park and adjacent areas from November 1993 until April 1995 when she left, presumably to find a mate elsewhere (Roberts 1995). Since then there have been different birds found in every year in the county, mostly in the period from mid-March to late-August, although there are only two records of two birds together, in July 1999 at Cholmondeley and on 31 March 2000 at Barbridge. Cheshire and Wirral is clearly within the normal dispersal range, at least of immature birds, from several breeding sites, in Wales, the east Midlands and Yorkshire. Young Red Kites, however, show strong natal philopatry, the tendency to return to breed close to the site where they themselves were reared. Kites are social birds, not least with their well known communal feeding and roosting groups in winter, and the adventurous birds that do breed away from their natal area tend to choose sites near to another existing population rather than in a brand new area: there are examples of recruitment in both directions, for instance, between the reintroduced populations in the Chilterns and east Midlands, 100 km apart, and birds from Germany have moved to breed in Wales (Carter 2001). The proportion of young birds that move long distances also decreases greatly as a population grows in size, thus being largest in the early years of a new group. All of these facts about the species’ breeding biology mean that kites can take a long time to spread their breeding range. This was one of the reasons for using several well separated regions for the reintroduction scheme, and tends to make it less likely that they will naturally colonise new areas, or at least to mean that it will take some time before an odd rogue pair settles well away from their natal site. The records during this Atlas were typical of recent years. After none in the 2004 breeding season, in 2005 one flew west at Bosley Reservoir (SJ96I) on 23 April, another bird on 28 May was seen first at Sandbach Flashes then [during Atlas survey work] near Holmes Chapel (SJ76M), and one on 18 June was seen over Henbury (SJ87S) drifting northwest. In 2006, there were reports of probably two birds: what may well have been the same bird on different dates at Overton (SJ44U), Handley (SJ45N) and Tattenhall (SJ45Z), and another on 10 June that flew over Woolston (SJ68N/ P). There were no records during the Atlas winter periods. Apart from a couple of long-staying individuals, winter records in the county have been scarce, with none in November or January, one for December and four in February.